Containers are available in nearly any color, size or style imaginable. Tall pots, short pots, hanging baskets and more. When it comes to choosing containers for your garden, indoors or out, how do you know which one is best? Let’s take a look at choosing containers for potted environments. 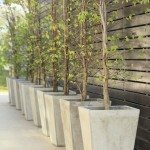 Tall pots are best suited for deep-rooted plants, shrubs or small trees. Small pots are ideal for shallow-rooted plants and flowering bulbs. Trailing and cascading plants or vines are excellent additions for hanging baskets. Then there are the other alternate choices. From bowls and boxes to barrels, wicker baskets and old boots, nearly anything can be used to accommodate plant life. As long as there are adequate drainage holes and a flat bottom, you really shouldn’t worry so much about choosing the best container for gardening. This is more or less up to the individual and his or her creativity. There are, however, differences amongst the most commonly used pots on the market. Taking note of these differences can make your selection easier for those new to the gardening realm. For instance, sturdy pots last nearly forever and work well in outdoor elements. 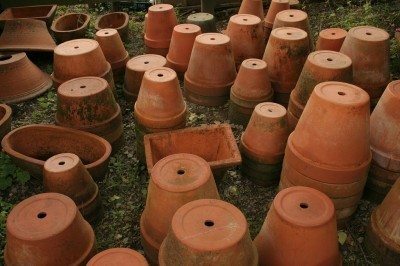 Clay Pots – Clay pots are porous, allowing air to easily pass through. They are quite sturdy as far as tipping over; however, they break easily. Since clay pots are porous, plants dry out faster and frequent watering may be necessary. Nonetheless, these pots are good for keeping roots cool and are ideal for growing drought-tolerant plants. Stone Containers – Concrete or stone pots are also extremely durable and well suited as permanent fixtures for outdoors. They are frost proof, so breaking is less of an issue. As these are quite heavy, they are good for windy areas but require continual watering. Their weight can make them difficult to move around, however, and are unsuitable for areas such as balconies or rooftops. Small shrubs and trees are ideal for this type of container. Decorative Ceramic Pots – Glazed ceramic comes in many different styles and colors. They can be quite decorative and more expensive as a result. Since glazed ceramic pots are generally smaller and more decorative, they are normally used indoors for houseplants. They also break easily. Metal Pots – Metal pots are good for displaying plants indoors or out but will eventually rust after some time, especially in outdoor elements. Metal containers also get quite hot outdoors so placement should be in shady areas. An ideal way to use these types of containers is by placing plastic fitted containers inside. This eliminates problems associated with rust or excessive heat. Wooden Containers – There are many styles of wooden containers, from formal planters to casual window boxes. Generally, cedar wood is most popular as it is longer lasting and pest resistant. Treated wood is not recommended due to the chemicals used in treating it, which may seep into the soil and become harmful to plants. Edible plants, especially, should not be placed in treated wooden planters unless you use plastic liners. Plastic liners will also help prolong the life of untreated wooden containers, as over time these will begin to break down. You could also consider painting them or purchasing those that have already been painted. Polyresin Containers – Polyresin containers are lightweight and inexpensive. These are great alternatives for use on balconies and rooftops. They are ideal outdoors, withstanding the elements of weather. However, they are likely to tip over in windy situations because of being so light. Nonetheless, polyresin pots are quite durable and look like the real thing, resembling stone or weathered concrete. Fiberglass Pots – Fiberglass containers are also lightweight and often used as substitutes for more traditional pots. However, they are not as thick, providing less insulation for plants outdoors. They are probably better suited for indoor environments. Plastic Containers – Plastic pots also do well indoors unless placed inside another, sturdier container. They are extremely light and topple over quite easily. Plastic pots can be found in a variety of colors and are the least expensive. They hold in moisture, however, so be sure to allow plants to dry out some between watering. They might also begin to crack over time if located in the sun, but this is not an issue for those labeled as UV protected. Polystyrene Pots – Polystyrene pots are lightweight as well. These are also inexpensive and nonporous. Polystyrene pots are available in many sizes and finishes so finding one to match your decorating style should not be a problem. They are also thick enough to insulate plants effectively both in the heat of summer and cold of winter, but light enough to go just about anywhere you want. The only downside is their tendency to blow over easily in windy sites. So those are the basics. Other than that, try to match the chosen pot to the plant as well as to the home. Containers for potted environments should always be large enough to accommodate the plants, and you want all elements of your potted environment to complement one another.